Note: This piece was originally published on 29 September 2013 to coincide with the fifth anniversary of the bank guarantee. We republish it today as the Banking Inquiry gets underway. Finance Minister Michael Noonan’s summing-up of the decision to issue a blanket €440 billion guarantee of all liabilities in the Irish banking system five years ago this week is one of the more dramatic but accurate summations. Ireland’s banking collapse has cost taxpayers some €64 billion and as we prepare to hear from the central players it’s worth remembering – over six years on – how we got here. Based on interviews, book extracts and evidence given to Oireachtas committees, this is an in-depth account of the days and weeks leading up to the 30 September 2008 – the day Ireland’s social, political and economic course changed forever. With interviews and research by Hugh O’Connell, Michelle Hennessy, Sinéad O’Carroll, Aoife Barry, and Daragh Brophy. Estimated reading time: 35 minutes. George Lee: “I was in the middle of writing a book… I had written about 80,000 words, I had a very good advance on that book. When Bear Stearns collapsed, I phoned up the publisher and said ‘I’m not completing the book’. “They said ‘Why?’ and I said: ‘This book is going to come out in October, November, December and I guarantee you the entire stage will have changed by then’. The tone in my book was ‘wake up, wake up, there’s trouble coming’. Eamon Ryan: “The collective sense in summer 2008 was that there’s a real problem. We did an emergency adjustment of €1bn in July 2008, that’s not normal. Joan Burton: “[There was a] worry that a golden period in the Irish economy was coming to an end, but the rhetoric on that was ‘soft landing’. 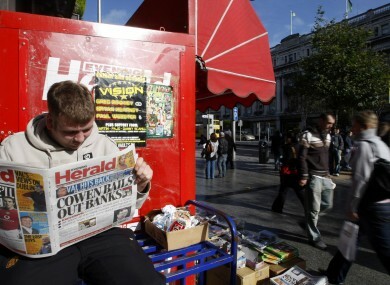 Patrick Honohan, author of banking crisis report (3): “The publication of a very adverse rating agency report on Irish Nationwide on 5 September 2008 heralded the final stage of the run-up to the guarantee. Also on that day, Reuters published a story that Irish Nationwide (INBS) was in talks with its lenders ‘to avoid insolvency’. The story was denied by INBS and later retracted by Reuters but was hugely damaging to INBS’ position. “… [I] said that the whole discussion on the economy was missing the single biggest most important fact: we would definitely have a banking crisis in the coming months and one of our banks would be bust by Christmas. George Lee: “When Lehman’s collapsed we were hanging on by our fingernails anyway. Anglo employee: “I can remember we had a large screen TV in reception and I remember Lehman staff leaving with their boxes and everyone thinking that was going to be us, that’s what was going to happen here. It was just a period of uncertainty. Tom Lyons: “One of the moments for me was post-Lehman’s… the great row that Anglo was going to save Irish Nationwide provided it had some form of guarantee. David McWilliams: “I showed him (Lenihan) an article I had written earlier that evening for my regular column in the Sunday Business Post which outlined the bank guarantee plan…. Eamon Ryan: “My colleague [Green Party leader and Environment Minister] John Gormley was involved with the Minister for Finance at that point and we had been approached by the likes of David McWilliams and others. Brian Lenihan: “At that point he (FitzPatrick) outlined to the Secretary General of the Department and me a plan he had to amalgamate or consolidate Anglo Irish Bank with the Irish Nationwide Building Society. Simon Carswell: “Word had spread around Dublin business circles that Anglo was pitching a takeover of Irish Nationwide with state support and I called the department to ask whether there was any truth in the story. “After receiving my call, [Eoin] Dorgan (Lenihan’s spokesperson) spoke to Lenihan, who told him that FitzPatrick was just leaving after their meeting and cheekily suggested that Dorgan could put the query to the chairman of the bank directly. On the same day, RTÉ Radio 1’s phone-in programme, Liveline with Joe Duffy, was taking call after call in which listeners said they were withdrawing money from their bank accounts. Simon Carswell: “The Department of Finance carried out a brainstorming session to consider more radical options to save the Irish banks. “Various forced mergers and takeovers were suggested, including the takeover of Irish Nationwide by Anglo… A merger of the two biggest banks, AIB and Bank of Ireland, was also considered, as was a tie-up of Irish Nationwide, IL&P (Irish Life & Permanent) and EBS. Simon Carswell recounts in his book ‘Anglo Republic’ that there was a major meeting at government buildings involving Brian Cowen, Lenihan, their officials, John Hurley and Tony Grimes from the Central Bank, Michael Somers and John Corrigan from the NTMA and the Attorney General. Merrill Lynch, PriceWaterhouse Coopers, the Department’s legal firm Arthur Cox, and an Irish Nationwide advisor from Goldman Sachs were also present. In his book Carswell also notes a meeting involving Lenihan, senior Department officials David Doyle and Kevin Cardiff, the Financial Regulator’s Con Horan and advisors from Merrill Lynch who outlined a range of options “to tackle the deteriorating situation at the banks”. Patrick Honohan: “It was felt by some that nationalising Anglo Irish Bank – which was facing by far the most serious liquidity crisis – would reduce the reputational damage that it was causing to the Irish banking system. Seán FitzPatrick: “Leading up to the 29th of September things were real bad. I mean real bad. It got real bad treasury end and financial end, meaning our liquidity. Brian Lenihan, having caught-up with Trichet’s messages, went to meet with officials at the Central Bank as well as consulting with the ECB. Mary Hanafin, Minister for Social and Family Affairs (8): “I remember the day particularly well, because I was going on Questions and Answers that night. “So, like any major television programme I was being well briefed… share prices were dropping, markets were losing confidence and as the day went on I was very well aware of a lot of meetings taking place in the Department of Finance. I recall getting a phone call from an official in the Department of Finance, saying, you know, there will be decisions before the night is out. Seán FitzPatrick: “You had Bradford and Bingley (part-nartionalised in the UK and sold to Santandar) announced that morning, you had rumours about Fortis and Dexia. All of these banks were not Irish banks, but they were all outside of Ireland but all dependant upon global liquidity and they were facing the same problems as us…. Kevin Cardiff: “One could probably identify five or six different things that went wrong that day that had not gone wrong as of the previous night. There were further banking collapses in Europe that were being worked on but I suppose we did not know about them over that weekend. George Lee: “I can guarantee you that there were people in financial circles who knew it but they did not know in the night of September – this is still annoying me- they did not know what the actual state of play in our banks were. Seán FitzPatrick: “I was at home. I was out for dinner with a friend of mine so I got home around about half nine, watched TV, and went to bed around about 11 o’clock. “I knew lots of things were happening because we had discussions obviously with the Central Bank, and with the Regulator, and indeed with the Department of Finance over the previous weeks. But that particular night I was not aware of what was happening. Willie O’Dea, Minister for Defence (9): “I got a bit of a shock, I have to say because usually when I was consulted for an incorporeal Cabinet meeting it consisted of something very technical like the Minister has forgotten to sign something, or the Cabinet have forgotten to sign off on something fairly minor and you automatically agree. Brian Lenihan: “Having weighed up the arguments, the unanimous view of the Central Bank and the regulator and the advice I received from my officials, with my own conclusion, the conclusion reached by the Government was that we should guarantee the institutions. Brian Lenihan: “I contacted Christine Lagarde, who was the president of the European Council of Finance Ministers at the time, and I explained to her in French what the position was. George Lee: “The idea that they would back everything [that] anybody who has every loaned any money to the Irish banking system, [that] we will guarantee it, without asking anybody? That was a huge, huge risk. Anglo employee: “As soon as we came into work we had customers waiting to withdraw funds, although there wasn’t a run on the banks. We would have been called into a boardroom meeting and literally our area manager came off a call with his handwritten notes to try and explain what was going to happen. Anglo employee: “People were angry they were considerate towards us because they were as clueless as us. There was concern about how we are going to have jobs. “… I was enormously apprehensive about what had been done when I was given the impression that Seán FitzPatrick and Michael Fingleton had a business model which was robust, when the dogs on the street involved in [the Department of] Finance knew that both of those financial institutions had extraordinary problems and I could not see that they were sustainable. Eamon Ryan: “I think – go back to the recent analysis – look at the alternatives and come back to me and show me an easier, cheaper option… I remember [at] the time the debate on radio stations with Joan Burton and Eamon Gilmore. Kevin Cardiff: “We set up a system. The general Irish system was such that we had a Central Bank and a Financial Regulator, each of which had a very independent position and had some limited independence from each other. Patrick Honohan: “As regards the substance of the guarantee itself, it is hard to argue with the view that an extensive guarantee needed to be put in place, since all participants rightly felt that they faced the likely collapse of the Irish banking system within days in the absence of decisive immediate action. Anglo employee: “In hindsight you can look at it and say the government did what Anglo did. They gave the money – they guaranteed without due diligence – they acted too quickly. (2) Brian Lenihan giving evidence to the Oireachtas Finance Committee on 26 February 2009 and in an interview for the RTÉ One documentary ‘Freefall’, broadcast in September 2010. (4) Simon Carswell in his book ‘Anglo Republic – Inside the Bank That Broke Ireland‘, published by Penguin in 2011. (5) David McWilliams in his book ‘Follow the Money’, published by Gill & Macmillan in 2009. (6) Seán FitzPatrick in ‘The FitzPatrick Tapes’ (by Tom Lyons and Brian Carey, published by Penguin Ireland in 2011) and an interview with The Marian Finucane Show, broadcast on RTÉ Radio 1 on 4 October 2008. (7) John Gormley in interviews with Vincent Browne on 22 November 2010 and Marian Finucane on 4 December 2010. (10) Christine Lagarde, in an interview for the RTÉ One documentary ‘Freefall’, broadcast in September 2010. (11) Alistair Darling – from his book ‘Back from the Brink: 1,000 Days at Number 11’, published by Atlantic Books in 2011. Email “30 Days in September: An Oral History of the Bank Guarantee”. Feedback on “30 Days in September: An Oral History of the Bank Guarantee”.